The feature was noticed by a user in Holland, Michel Wester, who says it popped up on a test account he uses. It first appeared not as an active feature, but as a (currently disabled) option in the settings on the account. He says that while the tab with the option disappeared earlier today, the URL for the feature still works for him in Chrome and Firefox, but not other browsers. (It’s unlikely to work for you unless you’re in Twitter’s test set, I suspect.) 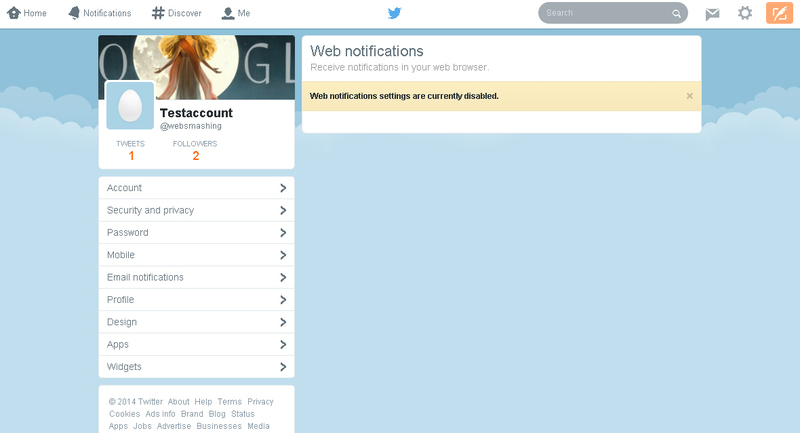 Above is the screenshot he provided us showing how Twitter’s feature looks right now in an English-language browser. It may be the backend, settings counterpart to the pop-up notifications noticed by Engadget earlier this year. We’ve reached out to Twitter to ask about this and will update when we learn more. The feature, if and when it goes live, could give Twitter more feature parity between its desktop and mobile experiences — something it’s been striving for in a more general sense with its redesigns and features like suggestions of promoted accounts to follow. On mobile, you can already get push alerts for tweets that mention your name from users you follow, for your retweets and favorites, and, in some markets, for selected accounts that have signed up for the Twitter Alerts service, no matter what else you’re doing on the phone (as long as you are within range of a data connection). On the desktop, you can get email notifications, and certain alerts in real-time on Safari for Mac. But in the most popular browsers like Chrome and Firefox, real-time notifications are the terrain of third-party extensions. Twitter this week announced that it will be reporting its next quarterly earnings on April 29. It has a tall order ahead of it to bring more users to its service — which counted 241 million total and 184 million mobile monthly users last quarter. But, perhaps just as important in a social media world that puts a lot of emphasis on engagement and time spent on site, Twitter needs to keep those who do use it coming back for more. In that sense, offering a notifications system where your Twitter alerts can pop up wherever you are online is one way of drawing existing users in. It’s also an interesting framework that Twitter could use and tailor to other purposes — not just for users’ own narcissistic pleasure of seeing where their tweets are flying, but potentially for Sponsored Tweets, or those from specific accounts designated by the user, or even a list you have (did someone say RSS?). I, for one, would really like to stay on top of whatever Kim Kierkegaardashian has to say. There is also some interesting timing here worth pointing out. The company on Monday announced the acquisition of Cover, which lets users create customised lockscreens for Android devices. Just as a hypothetical, Cover integration could place the Twitter experience and its content outside of the main Twitter walled garden — forever the subject of complains that it’s just too difficult to use — a browser extension could end up serving the same purpose on the desktop, seeding tweets you wherever you go on the web.